Yes, same stadium, two days in a row. Surprise Stadium is shared by the Rangers and the Royals, and this time the Royals were the home team against the Mariners. And, yes, I am still a Mariners fan. So we go from the sublime (the Cubs and Indians, fresh off their epic World Series battle) to the ridiculous (the M’s may have the longest current streak of not making the playoffs). I can’t help myself. 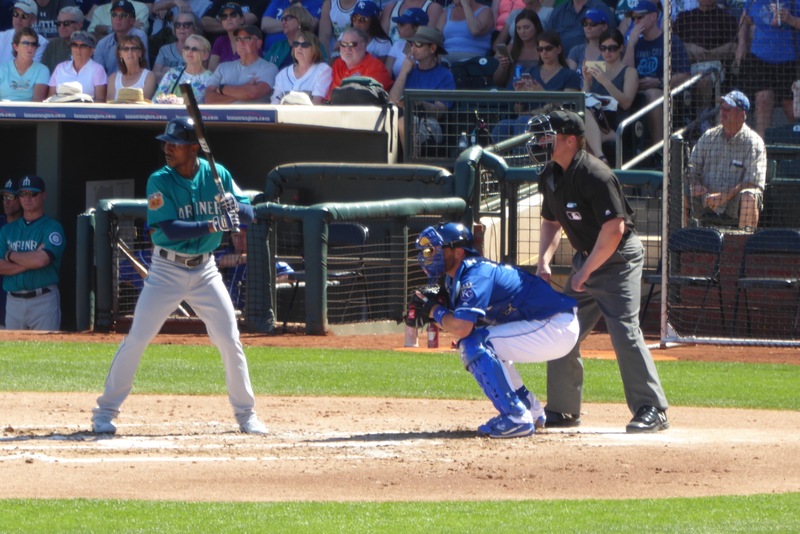 I’ll start by saying that I was delighted when the M’s got Jarrod Dyson from the Royals. The fellow I sat next to (a KC loyalist) did not share my happiness but agreed that M’s fans would be pleased. He had a very good day against his former team. At the outset, it looked like the varsity against the scrubs. The Royals started many of their vets, including Jason Vargas (a former Mariner), Lorenzo Cain and Mike Moustakas and their compensation for giving up Wade Davis to the Cubs, Jorge Soler. Seattle, on the other hand, was missing 14 players who were competing for various countries in the World Baseball Classic, so their team was largely no-names and a couple of recently acquired guys who are supposed to make them great again (wait, were they ever great?). Soler, by the way, didn’t look so good for the Royals. But lo and behold, the scrubs not only won, they dominated and looked very good. The Mariners played the best baseball we saw this week, with a couple of stellar defensive plays and very good pitching by Chase De Jong. De Jong, so the rumor mill has it, may make the starting rotation even though he’s never made the big leagues. He’s just 23 years old, but showed a lot of poise and definitely kept the Royals off balance during his four innings of work. The M’s may also have the player with the most unpronounceable name Marc Rzepczynski (zep chin ski), a veteran who has bounced from team to team for several years. Now for the mystery – the arm sleeve. It is all the style these days for athletes in many sports to wear an arm sleeve on their dominant arm. It supposedly helps in recovery from injury, prevents swelling, keeps the muscles warm, etc., etc. But riddle me this – with the temperature hovering at 95, who needs to keep their arm warm? I don’t get it. 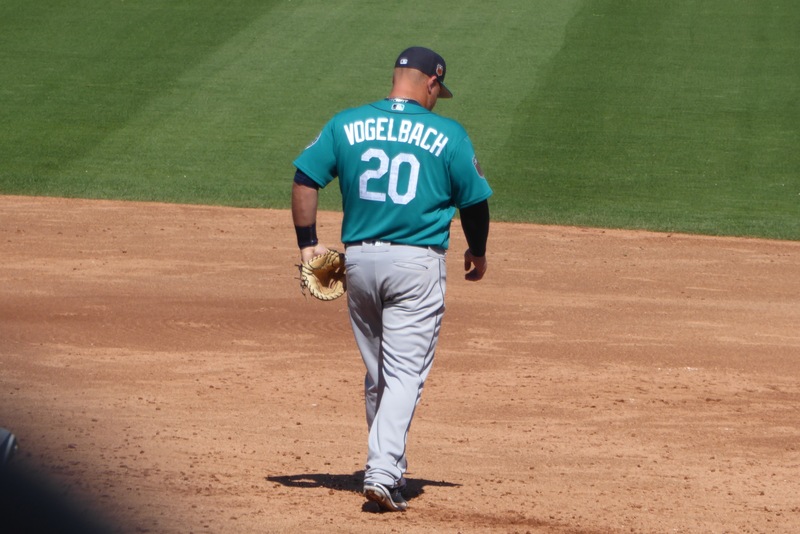 And one sporting the accessory, Seattle’s Dan Vogelbach (acquired from the Cubs last year), isn’t yet making waves in spring training. Oh yes, did I mention the monster dog? A foot of hot dog delight!